I’m not a fan of unless it’s this Carbonara. The Carbonara I have known since I was a kid has cream on it and I don’t particularly like cream sauce on my pasta. So I grew up not really caring for Carbonara. Not even once did I attempt to order it when I visited Italy some years back. During one regular potluck dinner, my friend talked about the Carbonara cooked for him by an Italian host on a recent trip to Italy (nope it was not even what he cooked that evening). What got my attention was the simplicity of the dish that seemed extremely appetizing and best of all it didn’t require cream on it. So one night I came home pretty tired but awfully hungry, I remembered that Carbonara. I researched a bit to make sure I made it correctly and this was what I came up with. It was simple, speedy and so satisfying I made it again the following evening. 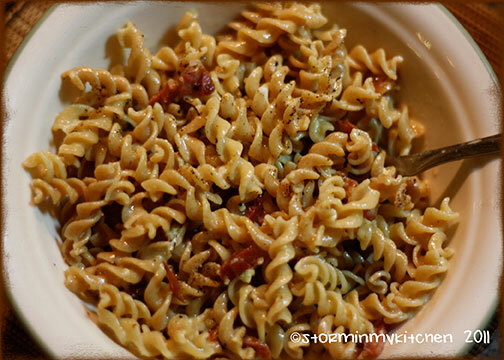 It has since become a go to for quick and easy dishes. Drop the pasta in a pot of salted boiling water. Cook according to package direction. Fry the bacon in a little olive oil. Add the minced garlic, taking care not to burn it. Using pasta scooper, scoop the pasta straight from the pot without totally draining. This way a bit of pasta water gets incorporated into the pan. In a small bowl, combine the slightly beaten egg with the cheese. Toss and thoroughly mix this with the pasta. Serve with more cheese, if desired. *Make sure when you add the egg mixture, it is away from the heat or the eggs will coagulate. I suggest waiting a bit before tossing in the egg mixture. Once I immediately tossed in the eggs, even if there was no direct heat, the eggs still coagulated because the pan was still very hot. 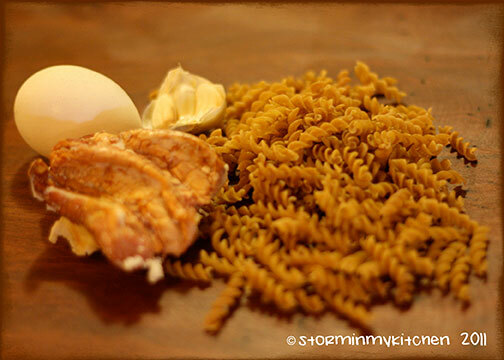 You can also transfer the pasta in a bowl and toss the eggs there. This can be quite addicting and above all, it takes less than 30 mins to prepare. Enjoy! I’m not a fan of creamy sauces either so I can tell you I’ve never had a carbonara before. I got spooked when I ordered alfredo one time and the creamy sauce was nauseatingly yucky. You are currently reading Carbonara… at Storm In My Kitchen.